Which LTE smartphone to buy? So you're in store for speed and you've heard about Verizon's blazing fast 4G LTE network, but with a couple of very similar phones out there you might wonder which one is right for you? 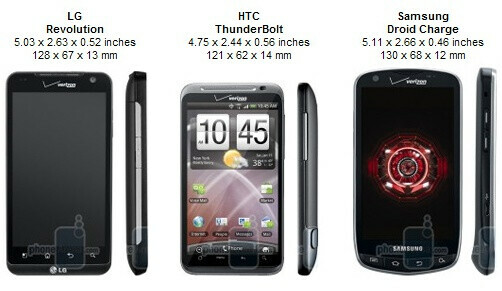 Currently, you have three options to choose from – the HTC ThunderBolt, the Samsung Droid Charge and the LG Revolution. They all share equally sized 4.3-inch screens, monstrous dimensions and heft, and super fast 4G LTE radio draining your battery faster than you can charge it. If any of those is a dealbreaker for you than you'd be better off waiting for the next wave of LTE handsets, but for the time being that's the compromise you have to make with any and all of the devices. 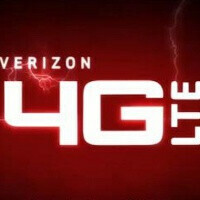 Verizon LTE-enabled phones share a lot of common features. But at the same time, while the similarities prevail, there are some key differentiators. Price for once – the HTC ThunderBolt just got a large price drop so you can get it for the sweet price of $100 with a two year contract on Amazon Wireless (otherwise retailing for $249.99 on contract), while the recently released LG Revolution and Samsung Droid Charge would set you back $149.99 on Amazon (otherwise retailing for $249.99 and $299.99 respectively) with a 2-year agreement on Big Red. Provided you only care about getting 4G and factoring in all the similarities, the HTC ThunderBolt is the most obvious choice in terms of a price/value ratio. All three handsets are LTE-enabled and this should translate into 5 to 12Mbps of downlink speeds advertized by Verizon and the reality of things is that, while there are some subtle differences, the phones register nearly equal speeds varying by the area. The underlying technology however might be somewhat different. For once, the ThunderBolt uses a separate Qualcomm MDM9600 chip for LTE, the same chip found on Verizon's MiFi modems, that has withheld a couple of months of solid testing. Apart from the mere technicalities, we've reached speeds of around 9Mbps on 4G in most cases. The LTE-enabled trio comes with procesors clocked at 1GHz, but while the Samsung Droid Charge comes with a Hummingbird chip with PowerVR SGX540 GPU, the HTC ThunderBolt and LG Revolution runs on Qualcomm's Snapdragon silicon with Adreno 205 graphics. Real-life performance on all handsets is relatively smooth, but we have to point out that the Droid Charge suffered problems with Flash-intensive websites. If that's not your biggest concern, we'd call a draw in the sheer performance of the handsets. The Samsung Droid Charge stands out in the display department with its Super AMOLED Plus screen with vivid colors. But on the downside, some might find them exaggerated and prefer the more neutral colors produced by an LCD screen. The LG Revolution and the HTC ThunderBolt both feature WVGA displays, but it's the luminosity of the Revolution that grants it an advantage over the ThunderBolt. Picking LTE, you'll have to sacrifice the trendy slimness of recent smartphones and go back to some traditional solid heft and large substantial looks. Picking among the three is a matter of personal preference, but it's the ThunderBolt that has the most weight and solidity among them with its 6.23 ounces of pure weight and 0.56” of thickness. The Droid Charge on its part has different, rounded shapes and elongated body, all in a slightly thinner and lighter package (5.04oz). Finally, the Revolution finds middle ground in dimensions with its simplified traditional candybar looks. The 8-megapixel snappers on the ThunderBolt and Droid Charge produce above average images, but the quality is far from impressive. If you prefer punchy saturated colors, the HTC ThunderBolt will be the right pick for you, while for more neutral tones you might want to get the Droid Charge. The LG Revolution packs a humble 5-megapixel camera, which yields images with cooler colors and less details, so we wouldn't rush getting it if photography is of prime importance. If you've never used an LTE phone, you might think that getting slightly more than a day out of your battery is pretty bad. That perception quickly changes as 4G LTE is such a battery drainer that you'd actually feel happy being able to get through the day on a single charge. Most well documented in this matter is the 1400mAh batter of the HTC ThunderBolt which barely gets to 7 hours of continuous talk time, but while the LG Revolution might be newer, its slightly larger 1500mAh juicer actually performs even worse with 6 hours of continuous talk time on a single charge. With both these phones you'll find it a challenge to come back from work with your battery still alive. The Samsung Droid Charge is by no means a huge improvement, but - considering the horrific battery life on the previous two - its 1600mAh juicer with 10 hours of continuous talk time gives you some confidence that you'll make it through the day with a functional phone. After factoring in all those little differentiators and considering prices, we can't overlook the fact that at $100 on Amazon Wireless, the HTC ThunderBolt is the best deal among the three. It would be our current pick, but if the vivid Super AMOLED screen and better battery life on the Samsung Droid Charge are of uttermost importance to you, they could tip the scales in favor of the Charge. To better pick between the two, feel free to check out our detailed comparison of the ThunderBolt and the Droid Charge. The LG Revolution remains a very close runner-up, but its Quadrant score, bright LCD screen and simplistic design could still swing the vote in its favor. none of the them!!!!!!!!!! TB, plaqued with reboots/horrible battery life/spotty 4G coverage everywhere I have gone that supposed to have 4G. Droid Charge, is a overpriced $299.00 Fascinate that adds LTE. Will probably be stuck on 2.2 for the next two years of your upgrade. LG Revolution is a brick, with Bing. Very huge phone. Has LG Dare look alike buttons on the side. Haha, That's exactly how I feel. Verizon really dropped the ball this time around. I don't get how they say the Revolution is thinner than the Thunderbolt? even if it is only 1 mm, I just put them side by side and they are the exact thickness. No matter, but I have had substantial amount of time to play with all 3 of these and hands down the Thunderbolt wins. The Charge has a pretty screen and slightly better battery life, but it has TouchWiz which boring and glitchy. I love Sense UI, and the fact that the T-bolt has the most RAM makes it a done deal, not contest for me. Battery life isn't a huge concern for me, I am often near a charger, and every smartphone I have ever owned, I have had at least a spare battery if not 2 or 3 spares. NOT SURE IF ANYONE NOTICED BUT SOME OF THE SPECS ON THE SNAPSHOT ARE WRONG.. FIRST OF ALL, THE DROID CHARGE HAS 8 MEGAPIXEL CAMERA NOT A FIVE, AND IT HAS TOUCHWIZ NOT OPTIMUS.. THAT IS LGs INTERFACE.. SAME FOR REVOLUTION OPTIMUS NOT TOUCH WIZ.. ANYWAYS.. REVOLUTION COMES WITH A 1400mah BATTERY NOT A 1500mah.. I OWN BOTH THE TB AND REVOLUTION AND I GET WAY BETTER BATTERY LIFE ON MY REVOLUTION.. BOTH UNPLUGGED AT 9AM BY 7PM I FIND MYSELF SWAPING SIM CARDS. AND REVOLUTION STILL AT 60%.. DESPITE EVERYTHING BEING TURNED OFF ON MY TBOLT. MY REVOLUTION HAS EVERYTHING ON.. GMAIL SYNC, YAHOO, FACEBOOK, WEATHER.. WAY BETTER BATTERY LIFE.. IM GUESSING PHONE ARENA HAS AN EARLIER MODEL WITH A DIFFERENT BATTERY.. SO THEIR EXPERIENCE IS DIFFERENT..
Hey, John, thanks for your comment and excuse our inaccuracy in listing the specifications. We've corrected the table to match the reality of things when it comes to the UI and camera of the Droid Charge. We're glad to hear that you're happy with the battery life of your LG Revolution, but unfortunately we still find it disappointing on our handset despite the fact that we could confirm that it's a 1500mAh unit. The Samsung Charge is the best one out by far. The 4G in Los Angeles is amazing, it doesn't go down like all the reports that have been out and it's faster that my cable internet which is really impressive. Hmm I have at&t right now an atrix. I live in los Angeles and believe it or not I never have dropped calls with att service in La. But I admit atts data network is not the greatest. Half of the time well more like 75% of the time its 3G network craps out and I have to use edge which is slower but works better than 3G. And honestly I'm getting tired of that. I wanna switch to Verizon cuz La already has verizons Lte which I heard is super fast but I dnt know I like the droid charge but at the same time I want a dual core phone so maybe I'm just gonna wait till Verizon gets a 4G dual core phone.